Short bike ride to Passau, Germany today, then the afternoon exploring Passau’s spectacular old town, on a peninsula where the Donau (Danube) and Inn (as in Innsbruck) rivers join. Tonight’s hostel is the Jungendherberge Veste Oberhaus – and the Veste Oberhaus is Passau’s spectacular old schloss on the ridge above the town, with an awesome view across the river into old Passau. 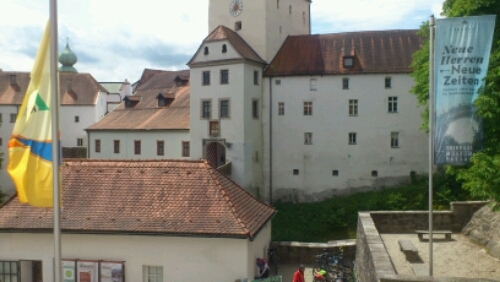 Part of Passau&apos;s castle, the Veste Oberhaus, from the stairwell of our hostel. Off to Straubing, Germany tomorrow, and our longest single day of the whole trip, 105km or so. Long day, but the weather looks like it’ll be clear and warm again, like today and yesterday.